More and more of us work on migration or with migrant workers these days. We also know that the migrant workers get the worst deal even in sectors where other local workers may have more decent working conditions. We are rightfully struggling to see that migrant workers are also treated justly and humanely and get their due rights as we work in the areas which receive the migrant workers. We also document the trials and tribulations of the migrants as these indeed are horror stories sometimes and are important to make public. While engaged in such work, we are less attentive to the reasons that cause/force people to migrate and the politics of how migrants treated. A large number of migrants leave their home areas because they are unable to make a decent living there. This is either because their areas are so ‘backward’ – where development has not reached, or because they have been forced to leave as the area has become inhabitable – lack of water, industrial pollution, social unrest, terrorism. In order to keep big businesses going in the name of a development, the companies need a lot of land, water and other raw material. So they come to our areas and buy up the land, set up a company. When the company begins to work, it is not we who get the work because we are not trained enough and moreover such businesses do not need too many people to work. The company also takes a lot of the ground water and we have less of it for our use and for our agriculture. It begins to pollute the surroundings or the air and our children get sick and our crops are affected. For those of us who sold the land, the price we got is not sufficient to buy more land and so we soon realise that we have to move. The only option is to move to a bigger city and of course there is always some work there – a street vendor, a domestic worker, a waste picker or a construction worker. So we have been forced to migrate and live a dehumanised life. Let us look at Naomi’s story. Naomi is a live-in domestic worker in Mumbai, where she has been working for the last 21 years. She actually came to Mumbai with her aunt when she was 16 years old from a village near Jarsaguda in Orissa. Naomi’s family owned land where they grew maize and dhals, gourds and a lot of vegetables. They always had enough food to eat, but because there were no good roads, they could not access the market when the harvest came to sell the excess production. Hence there was never much cash in the family. When she was young, she remembers that there were groups that were demanding roads and other facilities in the village. But then the police came and began to arrest the young people who were protesting. It was at this time that her parents thought she should go away and hence sent her with her aunt to Mumbai. She did not go home for the first four years and one day her father came to see her in Mumbai telling her that they had sold their land and were now living in the town. A big factory had come into the area and they could not live there anymore. They had got some money which they have put into the bank and so can pay the rent for the room. But they do not find work easily and her mother is ill. Her two brothers have gone to work in a factory nearby. He told her that she was better off in the employer’s house in Mumbai. She was very discouraged as she missed her home and wanted to see her mother and could not believe that her home and land around was no more. Two years later, she decided she would go home and after Christmas she told her employers that she wanted to go home. They readily agreed, reserved her ticket and she travelled back. She was surprised to see her parents in their new small one room home in a very dirty area. She cried and asked her father to go with her to the village. There was a new road now and a factory had come up. There were many trucks parked on the road. When they reached, her old village, she could not recognise the area. It was all changed, and deserted. She cried again and asked her father what had happened where had everybody gone and why? He too had tears in his eyes and said it was a long story, they had tried to stay but some people had sold the land already and then the factory came. They needed land for the roads, for the trucks and gradually they cut the trees. They put a fence around the tank and the next year there was no water in the village. Her brothers had said they would go to the city to find work and shortly after that their neighbour sold their land and so he did as well. But he did not know that life would be even more difficult in the town and he wept bitterly. 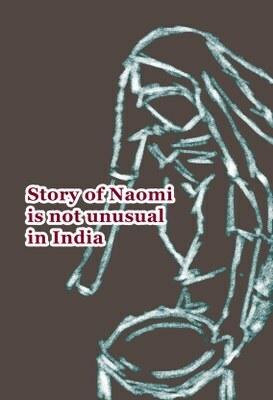 This story of Naomi is not unusual in India. There are thousands of ‘development refugees’ who are migrants in the cities. While Naomi is a live-in domestic worker, when whole families migrate, they live in the slums and try to eke out a living. They provide the cheap labour for the richer people in the cities and live very insecure lives. So for those of us who work with domestic and other migrant workers, it is also important that our unions work in the remote rural areas from where the migrants come. It is important to see how rural people can be organised to retain access to their lands and to organise them to safeguard their rights to livelihood. This is a topic for another article.